We left early Friday afternoon so we could slowly make our way out to the Castle Mountain Hostel and grab our desired bunks. The snow started coming down pretty heavy Friday evening so we were getting excited for great ski conditions for Saturday morning. Saturday morning we had breakfast, arranged car pooling and went on our way. As we approached Lake Louise we were surprised to see a long line of traffic on the highway slowly making their way up to the ski resort. We decided to continue on and turn around at Pipestone, thus avoiding the long line. 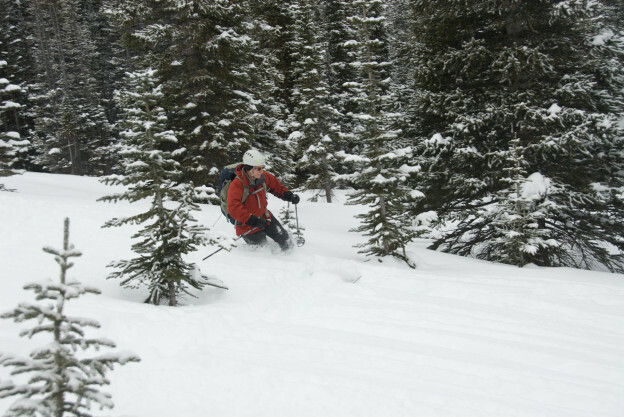 This entry was posted in Banff National Park, Mountain Tours, Trip Reports on 2014/04/13 by parkland. On February 22 ,2014 our family went on a back country ski trip. 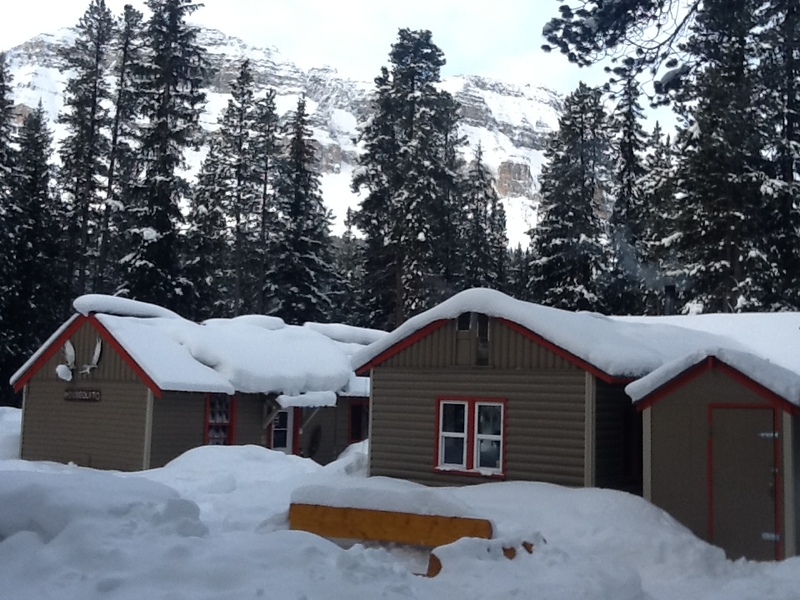 We travelled to Lake Louise, which is nestled in the Rocky Mountains to stay at Mosquito creek hostel. this adventure had me feeling nervous and excited. Nervous because there were no indoor bathrooms, excited because I was getting to spend the weekend with my friends. The walk to the hostel was breath taking, for you could see the mountains all around you. It turned out my nervousness was unnecessary, as the outhouses were actually little wooden structures, not the blue plastic kind, and they were surprisingly nice. When we arrived to our cabin we were greeted by happy faces and our beds were all made up for us. The main cabin had a common room , which had a very welcoming fireplace. The fire made the common room cozy and warm, which made it the perfect spot to play games. 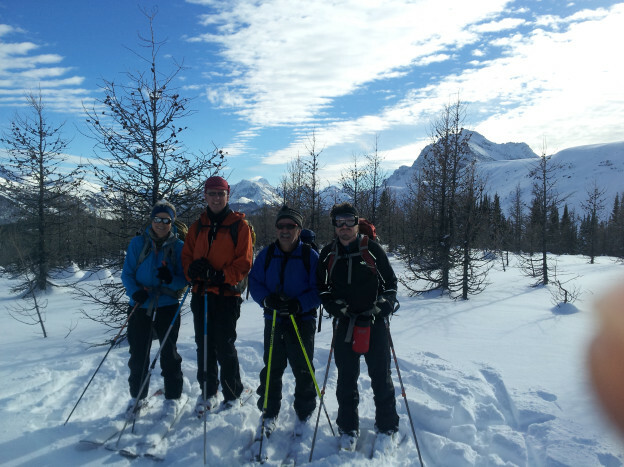 This entry was posted in Banff National Park, Mountain Tours, Red Deer Nordic, Trip Reports on 2014/03/29 by parkland. Trip members: Our fearless, capable and helpful leaders plus Dave A, Dion B, John and Linda D, Steve and Sandy I, Jock and Janet M, Marilyn S.
All arrived safely on Friday night with thanks to very good roads. Special thanks to Jeff who rescued a wayward traveller (plus wife and two teens) who had driven into the ditch near the junction of Highway 11 and 93. Our merry band of 11 happy souls made the 7.5 km to the toe of the Saskatchewan Glacier in about 3 hours. We followed the tracks of what turned out to be four skiers who had gone in the night before, skied over the glacier and who spent the night somewhere up in the back and beyond. 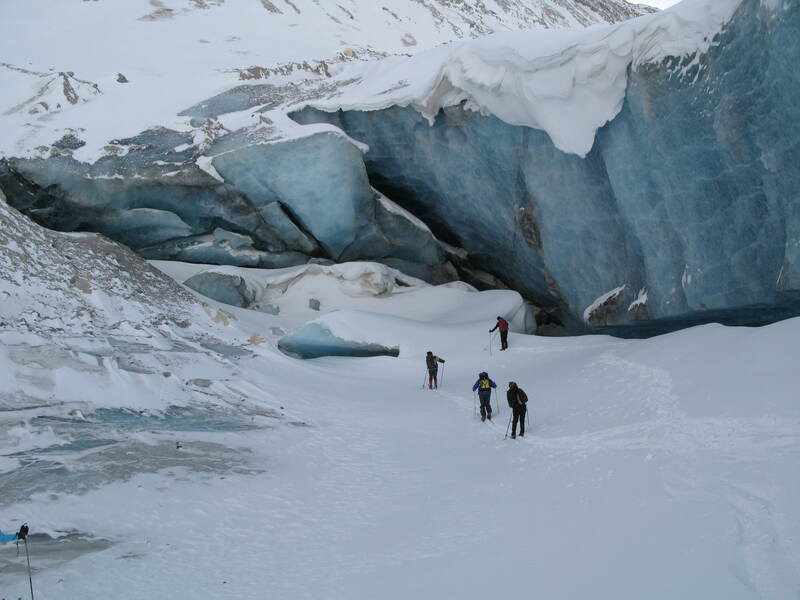 This entry was posted in Banff National Park, Mountain Tours, Trip Reports and tagged Saskatchewan Glacier on 2014/03/29 by parkland.